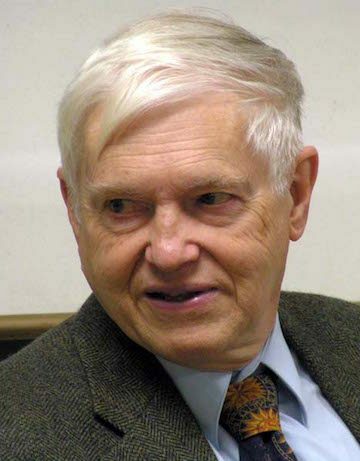 Owen Gingerich is Professor Emeritus of Astronomy and of the History of Science at Harvard University and Senior Astronomer Emeritus at the Smithsonian Astrophysical Observatory. Gingerich’s research interests have ranged from the recomputation of an ancient Babylonian mathematical table to the interpretation of stellar spectra. He spent three decades tracking down and examining surviving copies of Copernicus’ seminal work, On the Revolutions of the Heavenly Spheres, in which Copernicus first proposed that the Earth is not fixed but revolves around the sun. He wanted to determine who owned these copies, what marginal notes they made while reading the book, and what they thought of Copernicus’ then-radical idea. In his quest, he traveled to libraries throughout North America, Europe, China, Japan, and Australia, and he chronicles these adventures in The Book Nobody Read. Gingerich has been vice president of the American Philosophical Society—America’s oldest scientific academy—and he has served as chairman of the U.S. National Committee of the International Astronomical Union. He has been a councilor of the American Astronomical Society, where he helped organize its Historical Astronomy Division. In 2000, Gingerich won the Division’s Doggett Prize for his contributions to the history of astronomy. The AAS awarded him their Education Prize in 2004. He collects rare astronomical books, especially ephemerides (books that give the day-to-day positions of astronomical objects), and an asteroid—”2658 Gingerich”—has been named in his honor. Long interested in the science-religion dialogue, Gingerich gave the 2005 William Belden Noble Lecture at Harvard’s Memorial Church (published as God’s Universe) and he has served as a trustee of the John Templeton Foundation. For some years he served as consultant to the eminent designer Charles Eames, and he was an advisor for Cosmic Voyage, an Imax film at the National Air and Space Museum. He has given the George Darwin Lecture (the most prestigious lecture of the Royal Astronomical Society), and in 1999 an Advent sermon at the National Cathedral in Washington. A world traveler, he has successfully observed twelve total solar eclipses. Besides nearly 600 technical or educational articles and reviews, Gingerich has written more popularly on astronomy in several encyclopedias and journals. Two anthologies of his essays have appeared, The Great Copernicus Chase and Other Adventures in Astronomical History from Cambridge University Press, and The Eye of Heaven: Ptolemy, Copernicus, Kepler. He published God’s Universe, the William Belden Noble Lectures at Harvard in 2005. At Harvard he taught “The Astronomical Perspective,” a core science course for non-scientists, which at the time of his retirement in 2000 was the longest-running course under the same management at Harvard.